This was an important win, but it certainly had its worrisome features. 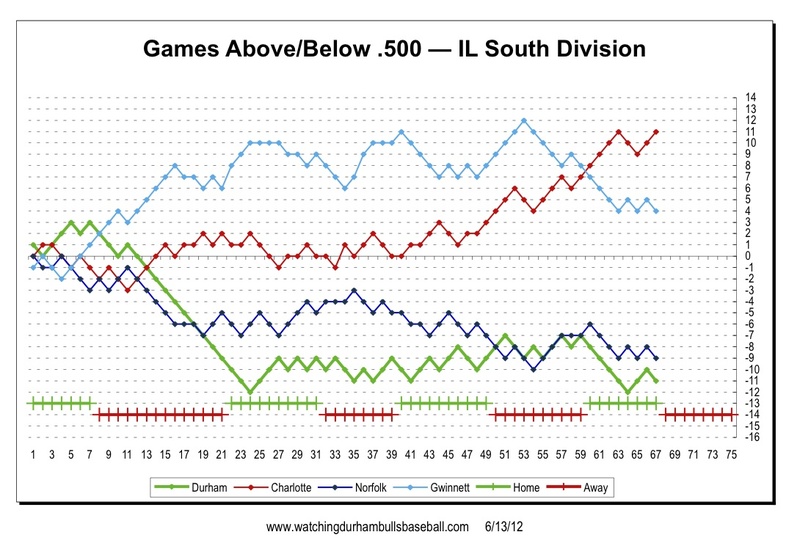 With the win and Gwinnett’s loss the Bulls claim sole possession of third place in the IL South. For the first time since April 24th the Bulls aren’t in the cellar. That’s good. The very solid pitching by Lance Pendleton, Frank De Ls Santos, and Dane De La Rosa was impressive. The breakthrough 6th inning was fun to watch. Note that Rich Thompson had a stellar night: 3 for 4, a walk, a run scored, a RBI, and 2 stolen bases. Maybe not. For one thing I’d bet that the Tropicana doesn’t have a basement, but you’ve got to wonder. Wednesday night it was Kyle Farnsworth for one inning. Last night it was Alex Torres (who looked awful, by way. He started off the 2nd inning giving up three singles and a walk before Nunez came in) and Jhonny Nunez for two innings, Farnsworth for one, and then the scheduled starter, Lance Pendleton, came on in the 4th. By the time he came in the Bulls were behind 3-0. Also worrisome item was watching young Tim Beckham at second base. He is a gifted athlete and I’m sure he will get the hang of it, but not yet. At least one double play was missed. You can sense Brignac coaching him out there. That will likely pay off. Then there were the 12 runners left on base. I have to point out that if the Bulls had not won, Henry Wrigley would have been the goat. He singled in his first at bat. In his next four at bats 9 runners on the bases. Only one of them got home when the Chief's first baseman botched a Wrigley bouncer. Still, a win under trying circumstances. Well-done! With Jeremy Hellickson coming of the Rays’ disabled list, Chris Archer is on his way back to Durham. Unlikely he will get a start here before the Bulls hit the road. He did just fine in his first major league appearances. With Luke Scott back on their roster, the Rays will have to cough up someone else. Stay tuned. Joel Guzman, who spent most of two seasons with the Bulls, has been released from the Cincinnati Reds AA team. 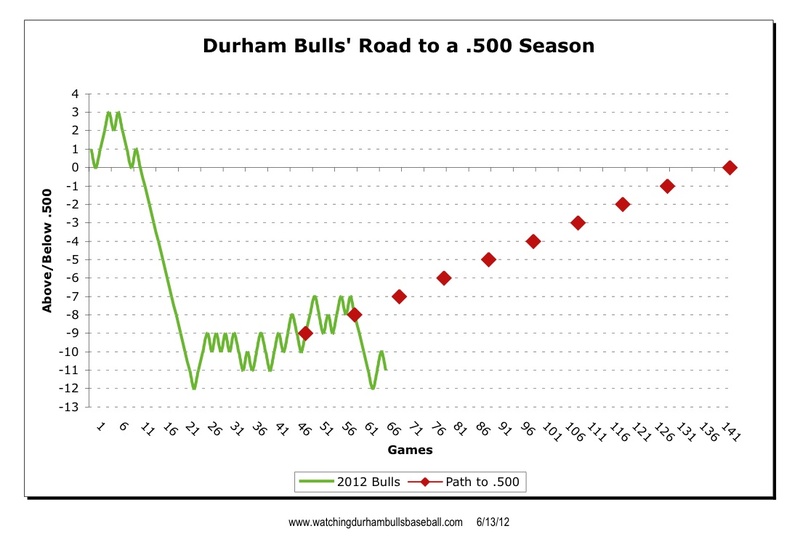 The last time we looked at this one, the Bulls were 11 games below .500 and had allowed almost 90 more runs than they had scored. Times are better. 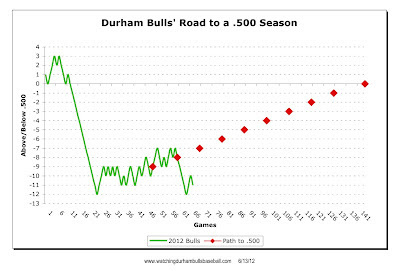 The Bulls are now 5 games below .500 and the the RS-RA number is a much improved -53. Going back to our Pythagorean Expectation formula the Bulls are doing better than expectation. The Bulls are 38-43, the formula says they should be even worse off at 35-46. Luck or relievers? I’ll take both or either, with some money on the Bulls relief corps. The trend line is a 10-game moving average. Welcome to minor league baseball. 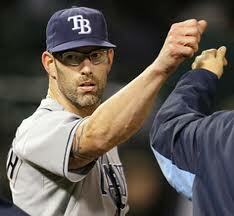 Tonight’s starting pitcher will be rehabbing Tampa Bay Ray closer Kyle Farnsworth. He’s been on the disabled list all year and has been making his way back to the Rays for the last couple of weeks. His last major league starting assignment was with the Cubs back in 2000. He is, in fact, one of the premier closers in the game with 25 saves last year. At a guess, he will pitch just the first inning and then Matt Torra will come on. That’s what he’s been doing with the Stone Crabs down in Charlotte, Florida. Alex Torres is back from the Rays after essentially hanging out with them for a couple of days. Sad to see a young man jerked around like that, but that’s just how the game works. Did not get into a game. I mentioned my concern about Leslie Anderson last night. He’s headed for the DL with a slight groin pull. By the time the first three Bulls hitters in the 1st inning were done, the Bulls were ahead 3-0. They never looked back. Jeff Salazar hit a lead-off home run (his 5th, and he had a terrific night in the field). Catcher Stephen Vogt hit a single. Henry Wrigley hit his 6th homer (and collected his 21st and 22nd RBI). A good start and it got better. Brandon Allen has some huge career stats which makes me wonder why he wasn’t claimed by another team when he was DFA’d (probably some aspect to the rule that I don’t understand). True, he was having a rough start up in Tampa and started slow with the Bulls as well. But look at him now! Two home runs (his first with the Bulls) and 4 RBI last night. Since his first game early in the month he has put up a batting average of .416 and a stellar OPS of 1.098. Plus he’s been playing a lot of outfield (Tampa Bays’ call?) instead of his usual first base. Glad to have him on the team. Jim Paduch is certainly a workhorse. He threw 104 pitches last night and kept the Bisons to just one run (and that was unearned). That’s two very solid outings in a row. Here’s hoping he can keep it up. Tim Beckham started at shortstop with Reid Brignac at second. Beckham did OK at the plate, 1 for 4, and threw one away for his first error since returning. This was the first four-homer game for the Bulls this year. Romulo Sanchez faced two batters in the 8th inning, walked them both, and left the game. The Herald-Sun is reporting “shoulder tightness.” That’s the second pitcher in three days who has left the game with a problem (Bryan Augenstein left Thursday’s Rochester game early). With Torres being called up, the Bulls may have some serious problems (or more serious than usual) in the pitching department. All the more important for the hitters to keep at it. With Beckham’s return, the Bulls had an unusually strong bench: Gimenez, Anderson, Thompson, and O’Malley were sitting out the game. See last night’s post regarding Alex Torres and Matt Buschmann. Some early versions of this year’s Bulls schedule had Monday’s start time at 1:00pm. That’s changed. It will be 12:05 to accommodate MLB telecast. There have been some surprising changes in the International League South Division in the five days since we last looked at this chart. The Bulls have won 4 out of 5, the Gwinnett Braves have fallen off the face of the earth; Charlotte is stalled; and Norfolk is on a run. Interesting times. A five-year pro with some AAA time in the PCL, Buschmann looks to be an interesting guy. Stats. This has been a tough year for Reid Brignac. He had a great game, so let’s celebrate it. The night didn’t start all that well for him. He came up in the 2nd with men on first and third and hit into a double play. When he came up in the 5th as the leadoff batter, the Bulls were behind 0-2. He hit a grounder through the middle, went to second base on a wild pitch, and came home on a Cole Figueroa single. In the top of the 6th, he started a very clean double play for the first two outs of a scoreless inning. By the time he came up in the bottom of the inning, runners were on first and second with one out. Brignac singled, sending the Chris Gimenez home as the tying run. Later in the inning, Cole Figueroa (again) hit a sacrifice fly to bring him across as the third run of the inning and the Bulls were ahead 4-2. In the 7th inning Brignac came to bat with runners on first and third and hit a double for his second RBI of the night. By the end of that inning, the Bulls were ahead 6-3. In the 8th there was a blemish on his night when he grounded out with the bases loaded. However, in the 9th he made a spectacular move to start a crucial double play that got Dane De La Rosa out of trouble. Three hits, 2 RBI, 2 runs scored, two double plays started. Darn good evening at the park. In the meantime, the rest of the game was just plain fun once the rain stopped and the first couple of pretty dull innings got past us. Lance Pendleton worked really hard (99 pitches) to get his first win in a while. Frank De Los Santos, the Bulls new left-hander made his first AAA appearance and faced just three batters at the end of the 7th. With a man on first he gave up a triple, then an intentional walk, followed by a strikeout. Not great, but OK. With a string of right-handed batters coming up, Dane De La Rosa came in for a two inning save. He did that, but it was a struggle. He was pitching with no rest from the day before, and it showed, especially in the 9th inning. Overall, the Bulls festival of hitting continued. They went through 6 Bison pitchers and collected 13 hits, all but one singles. 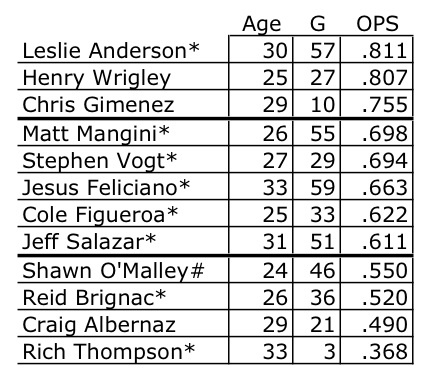 In addition to Brignac, new guy Brandon Allen, Cole Figueroa, and Chris Gimenez had multi-hit games. Then there was Shawn O’Malley essentially outrunning the Bison pitcher to beat him out covering first base for a single. That was fun. And Charley Montoyo should pat himself on the back for a 9th inning defensive move. He took Matt Mangini out of the game, moved Stephen Vogt from left field to first and Jeff Salazar came in to play left. Vogt made a spectacular play (following Brignac’s double play mentioned earlier) to end the game. With Beckham back and Drew Sutton DFA’d and Thompson coming back, who’s out and where are they going? Stay tuned. These last four games were by far the most productive of the year. 65 hits, 92 total bases, and 34 runs. Today’s game just topped it off with the most hits and most runs of the year. Every Bull got at least one hit, most got a bunch, Stephen Vogt got four. Amazing, amazing few days. Montoyo keeps moving guys around. So much so that it will be hard to put a position label on these guys. Today Chris Gimenez, normally a catcher, played outfield. Brandon Allen, very much a first baseman in his career, played outfield until today, when he started at 1B. Rehabbing Jeff Keppinger DH’d today, but he played 3B for a couple of days and 1B in the first game of the series. This was the first really hot day of the season and, according to broadcaster Patrick Kinas, the players were feeling it. Certainly the heat seemed to take a toll on the pitchers. Between Rochester and Durham, they used up 10 of them. Can we look forward to a better home series than last time? I sure hope so. I hope even more that I’ll be able to get out to the games. Left-handed relief pitcher Frank de los Santos is coming to Durham from the Montgomery Biscuits. Stats and more stats. He’s not on any top prospect lists that I’ve seen, but it looks like he’s having a good year. It will be his first time at AAA. The Bulls have a vacancy in their roster and will probably have another now that Rays reliever Joel Peralta has been given an 8-game suspension. The Rays claimed an infielder, Brooks Conrad, from Milwaukee. Coming to Durham? Can’t tell. 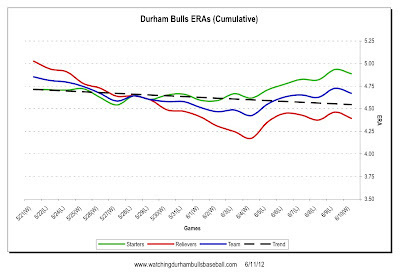 Yesterday I mentioned that regular reader Chris D has been looking at Bulls hitters’ OPS numbers and comparing them to their historical averages. Several weeks ago most were well below their average performance. Chris has updated their numbers, with additions and subtractions. Just about everyone is still below average. Note: this table does not include today’s performances. 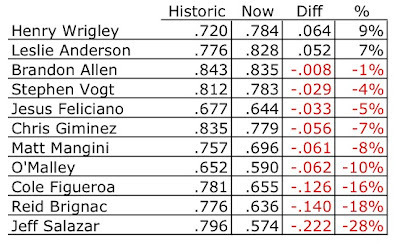 Except for Vogt, who was not with the Bulls back then, I’d guess there was some, but not too much, movement. Thanks, Chris! 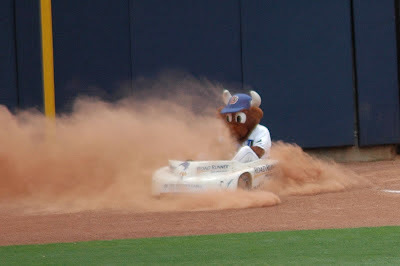 These last games have been great baseball for the Durham Bulls. Yes, they lost last night in the bottom of the 9th, but look at all those hits — 16 hits on Monday, 14 on Tuesday, 15 last night. We, of course, must give some credit to Red Wings pitching; nevertheless, I sure wish I’d been able to see the Bulls at work. Among other highlights, Reid Brignac climbed up above the Mendoza line on Tuesday and stayed there yesterday. Leslie Anderson had an outage last night, but remains the top hitter in the IL. Chris Gimenez got his first home run of the season. Stephen Vogt got one hit to go with his season-best 4-hit night on Tuesday. Shawn O’Malley got an RBI as a pinch-hitter! Brandon Allen’s hitting well, Henry Wrigley’s doing OK, Matt Mangini’s looking good. Is it a turnaround for the team? Well, no, because pitching is still the heart of the game and the Bulls' starters are trouble there. But for the first time this year, the hitters are making a difference. And that makes for fun baseball. Have to point out that the two runs scored against Brandon Gomes last night are the first runs he’s allowed since the 21st of May and that the run on that date was the only run he’s allowed this entire season! Bad luck and a good eye by Rochester’s Wilkin Ramirez made the difference in the game. The kerfuffle over Rays reliever Joel Peralta’s pine tarred glove will affect the Bulls. Assuming he’s suspended, we can expect the Rays to call up a reliever to fill in. Unless I misunderstand the rules (probable) Brandon Gomes has to stay here for a while before he can be called back. That leaves Dane De La Rosa, Alex Torres, and Josh Lueke available without messing with the Rays 40-man. Rich Thompson hasn’t left the bench yet. Chris Archer did just fine in his debut. He looked terrific, but suffered some bad luck in the first inning when former Bulls Johnson and Rodriguez botched a play. He went on to strike out 7 Nationals and did not allow a run after the first inning. BurGi over at Rays Prospects has updated his analysis of pitchers in the Rays system. Nice work. I have to admit that it sort of creeps me out to see folks measure luck, but that's what's out there over at Rays Index. Interesting analysis of Rays hitting this year. Hard to bring that kind of analysis into minor league ball, but not too different from what Chris D did for us a while back. Chris Archer is headed for Washington, DC to join the Rays after Jeremy Hellickson went to the disabled list. I know that I've been critical of Archer here on this blog, but all the best to him on Wednesday when he should be making his first start. Pretty much a stake through the heart of the Bulls, though. No word if there will be a replacement coming up to the Bulls, who were already a man short on the roster. In the International League a season consists of 144 games. 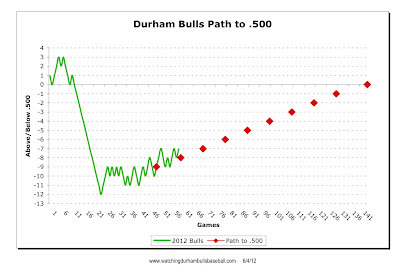 Last night’s game was the exact mid-point for the Durham Bulls. Seems early doesn’t it? Well, in comparison to the major league baseball, it is early. The majors play more games and they play on a much more leisurely schedule. Today, for example, the Bulls’ parent club is in Washington, DC to play only their 67th game. Triple-A ballplayers simply work harder, all chasing the dream of at least a September call-up. As we all know, this isn’t the Bulls’ best year for a lot of reasons. Can we hope for something like stability and maybe some better starting pitching for the second half of the season? I’m a notoriously poor predictor, but my best guess is that we can look forward to improved hitting as the season progresses, but our pitchers are just going to have to make the best of it. To get another look at the Bulls in mid-season I checked back on game 72 of 2011. It was played against the Buffalo Bisons at the Durham Bulls Athletic Park. On WDBB I took the occasion to let off a rant about the Bulls uniform jerseys. As an indicator of the influence this blog has, the Bulls are still wearing those jerseys and I still can’t read the numbers. 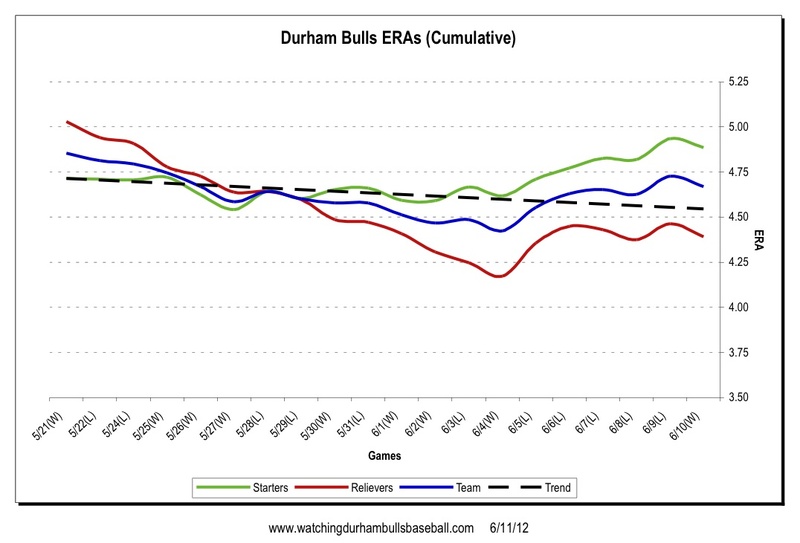 The box score provides an interesting insight into Triple-A baseball and this year’s Bulls. If you click through, or check the lineup below, you will see that none of the position players and only one of the pitchers for Game 72 of 2011 is on the Bulls 2012 roster. The list also points out some of the bad luck within the Rays system for 2012. Among those who played in game 72 last year, seven are still in the Rays system. 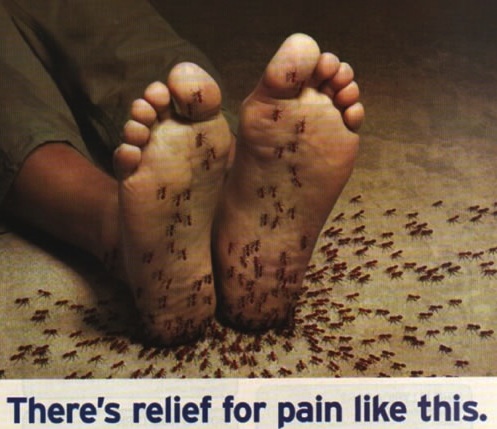 However, four of those seven have been on or are on the disabled list. One is out for the year (Guyer) and another (Chirinos) hasn’t been heard from since Spring Training. Omar Luna is down in Montgomery with the Biscuits. These are, of course, not the only players on the roster a year ago and a few of those are still with the Bulls. I can only remember Leslie Anderson and pitchers Ryan Reid and Alex Torres. Maybe more, but no other names come to mind. Otherwise the Bulls have had essentially a complete turnover from 2011. The stability is in the staff: Montoyo, Allen, Myers, Sandoval, and Trainor. Another mid-season thought is to take a look at this year’s candidates for the WDBB’s Moonlight Graham Award. That award is given to the player with the least amount of time in a Bulls uniform. Last year’s winners are here, along with the key criteria for selection. So far, it looks like Mayo Acosta at 9 games and 24 plate appearances is the leading candidate for the position player, but I have to think someone will pass through with less time than that. Among the pitchers, it Adam Liberatore’s one inning could be a lock unless he comes back from Montgomery and gets in some more innings. Lastly, a chart (of course). 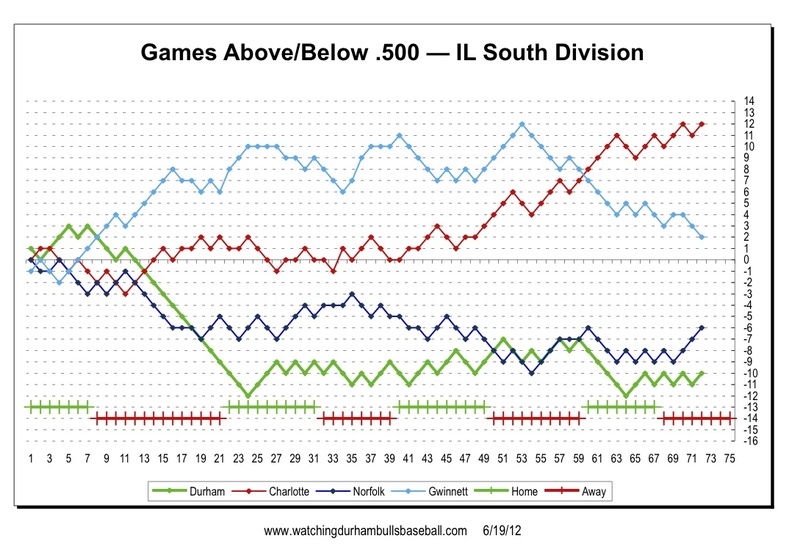 Here’s where the Bulls stand in the South Division of the International League at mid-season. The Bulls rode the bus(es), the rehabbing major leaguers Jeff Keppinger and Evan Longoria rode the plane, but everyone made it to Rochester to play the Red Wings for the midpoint game of the Bulls season (more about that in another post). For everyone except Evan Longoria, it was a great game. He left after his first at bat and Tampa Bay sources are saying that he’s headed back to the team to continue his rehab under Rays’ trainers. Couple of interesting photos at the Rochester Democrat link. In the meantime the Bulls hitters had one of their finest nights of the season. The Bulls' 16 hits included four doubles and a home run. 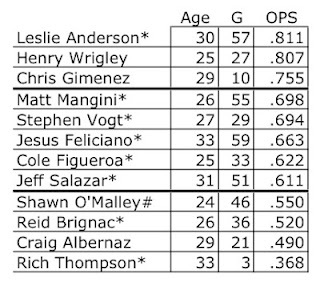 Every Bull who started the game except for Longoria got at least one hit and Stephen Vogt, Jeff Keppinger, Leslie Anderson, Brandon Allen, and Reid Brignac (!) got multiple hits. In fact, Brignac’s 3 hit, 3 RBI night has got to be his best of the year (not counting his grand slam a while back). Brandon Allen’s contribution of 3 hits is particularly welcome. Nice to have another hitter on the team. I can’t avoid mentioning Leslie Anderson’s continued hammering at Tampa Bay’s door: his batting average and number of hits are the best in the entire International League! To make the evening even better, Jim Paduch’s performance was his best in a month and came after a very long dry spell and a disastrous last outing. I guessed right! Rich Thompson is headed for Washington, DC to fill a roster spot for the Rays/Nationals series. Here’s hoping he gets a chance to play. Maybe he caught a ride on the same plane as Longoria. As mentioned yesterday, Brandon Gomes is headed back to the Bulls. However, in one of those asymmetries between minor league and major league baseball, a guy coming “down” gets a couple of days to get there while a guy going “up” moves right away. The practical effect for the Bulls is that they would be two players short in the dugout without the presence of rehabbing Keppinger and lurking Hudson Valley player Craig Albernaz. Speaking of Keppinger, he played first base last night. Wonder why? Also reported last night was a move to put Alexander Torres back into the starting rotation. He will swap with Shane Dyer who has not been particularly impressive. But neither has Torres as either a starter or reliever. Is this the last hurrah for Mr. Torres? Noted on the field was former Bull Matt Carson now playing for the Red Wings. Fascinating look at the prospects in the Rays system at Rays Prospects. Not many Bulls on the list. 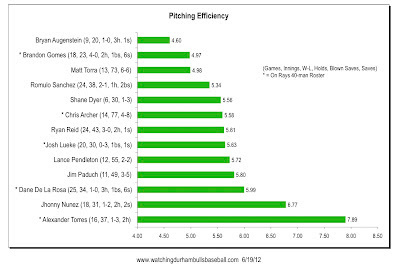 Pitching efficiency. A simple metric that displays how many pitches it takes to get an out. I'm not picking on Torres, really I'm not. They are his numbers after all. Yes, the Bulls lost, but this one was an interesting, well-played game. Lance Pendleton had as good a start as could be expected. He went five full innings (95 pitches) and kept the Iron Pigs to one run. Romulo Sanchez went three scoreless innings for his longest stretch of the year. Josh Leuke kept them scoreless for the 9th and 10th, but couldn’t hang in the 11th. Running one man short among the relievers, and not expecting any help from Tampa Bay, keeping Leuke in the game made sense. But sure would have been nice if the Rays hadn’t pulled Gomes when they did, or at least sent a replacement. Stephen Vogt, Matt Mangini and rehabbing Evan Longoria were not in the game. Would their slightly better bats have made a difference? Also hard to tell. The Bulls did not have a lot of opportunities against a pretty good Lehigh Valley pitching staff. The Iron Pigs second baseman Kevin Frendsen, who gave the Bulls fits all through the series, singled to start the 11th. Got to second base on a balk. And came home on a Jason Pridie single. That was enough. Brandon Gomes is coming back and a position player will be sent to join Tampa Bay in time for the Rays' Tuesday game in DC against the Nationals. That gives me an opportunity to guess wrong, again. I’m going with Rich Thompson, again. Wonder if the major leaguers will travel to Rochester with the Bulls or ride in greater style? Broadcaster Kinas probably said something about that but I missed it. The Bulls are off to Rochester to play the Red Wings, the Minnesota Twins AAA team. The last time the Bulls were in Rochester was just last month, but they were there to play the homeless Scranton-Wilkes-Barre Yankees. This time they are playing the actual residents of Frontier Field. The Red Wings are 32-37 and in fifth place in the six-team North Division of the International League. The Bulls’ bats, which had been so hot on Thursday, chilled out on Friday and didn’t heat up until the 7th inning last night. And then for only one run. But that was enough. “Pitchers’ Duel” is an overworked cliche, but what else can you say when Matt Torra goes head to head with the Iron Pigs’ Matt Wright for six scoreless and near hitless innings? At the top of the 7th Leslie Anderson (who else?) singled, got to third on a Stephen Vogt single, and came home on a Brandon Allen sacrifice fly. That would be enough, although the Bulls picked up two more runs in the 9th when the Pigs third baseman dropped a foul ball, Allen and Brignac singled, and Cole Figuaroa doubled them home. Matt Torra has won four of his last five games and has only allowed one run in those four wins. Has he turned a corner? Did that brief stretch on the DL help? Sure hope so. My new favorite pitcher, Bryan Augenstein, got the first save of his career with two-hit, three strikeout 9th, after Dane De La Rosa handled the last of the 7th and the 8th innings. Oh yeah, rehabbing Evan Longoria was 1-4 at DH and Jeff Keppinger did not play. Today's game is at 1:35. Have to admit that the folks in Lehigh Valley love their Iron Pigs. Sellout crowds (10,100) Friday and Saturday nights. They lead the International League in average home game attendance. Former Bull beat former Bull in the 15th inning last night down in the St. Petersburg bandbox by the bay. Brandon Gomes came on in relief in the 14th and had a quick 3 up, 3 down. But in the 15th, with one out, former Bull, now Marlin, Justin Ruggiano hit a double. The next batter hit a triple sending Ruggiano home, and that turned out to be the winning run as the Marlins beat the Rays 4-3. Showing once again that WDBB can be depended upon to guess wrong, reliever and WDBB favorite Brandon Gomes has been called up in place of outfielder/DH Luke Scott. In my defense, you have to agree that it was at least plausible for me to guess in this morning's post that a position player would be called up to stand in for Scott, not a pitcher. And I wasn't the only one who guessed wrong. The smart money (and the not-so-smart) was on Lehigh Valley favorite son Rich Thompson. Guess he gets to stick around in Allentown for a while longer. Undoubtedly under different circumstances we and the Durham Bulls would never have seen Brandon Gomes this year. He's really, really good. The really scary possibility is that someone else will come back when Scott comes off the DL. Want to have a daytime fright? How about J.P. Howell? Chris Archer had his best game of 2012, only letting two runs across and those in the 7th inning after the Bulls were ahead 9-0. And he was efficient, only 91 pitches. See the MiLB.com story for some of Chris’ own thoughts on his performance. In the meantime, Bulls hitters went nuts. Leslie Anderson hit his 8th home run and had two more hits. Reid Brignac hit a homer and a double. Every other Bull had at least one hit, most had RBI, Anderson had three. It looks like the day of rest on Wednesday really did make a difference for all concerned. Up in Allentown, however, the big deal last night was the return of Rich Thompson. He played for the Iron Pigs for five years and was very active in the community, a real favorite of the fans. All of the leads from the day focus on him. He got called out before the game for a standing O and a good-bye/welcome back cake. For example, the Morning Call, Lehigh Valley, and the Iron Pigs own wrap. The Iron Pigs are also the only team in the International League with two fan blogs (Bacon and Biscuits and Horn and Bell). They led with stories, photos, and video of Thompson. One blog is promoting the retirement of Thompson’s number. 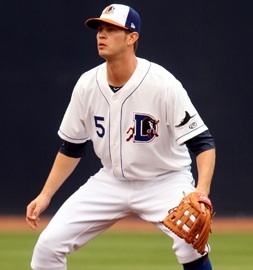 Rays infielders Evan Longoria and Jeff Keppinger are expected to put on Durham Bulls uniforms today or tomorrow. This will be the first time since 2008 that Longoria has been in Bulls gear. At the time it was thought that he might have a chance in the majors. Guess he’s done OK. No info on how long they will be with the Bulls. I’d think that after the recent sweep by the Mets, the Rays would like to have them back as soon as possible. Rays outfielder/DH Luke Scott is going on the disabled list. The only position players on the 40-man are Rich Thompson, catcher Chris Gimenez, and shortstop Reid Brignac. Possible that Thompson will be the guy to go, but will Brignac be given another shot? 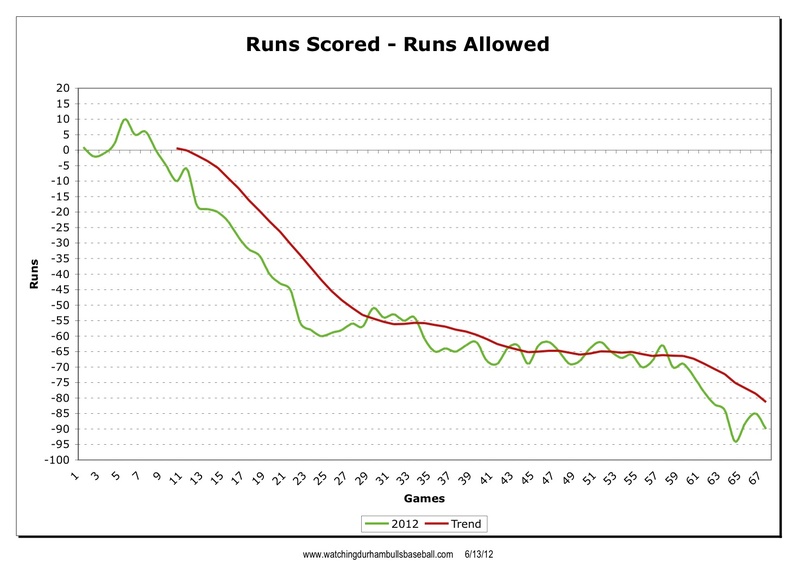 Time to look again at how the Bulls are doing in the runs scored, runs allowed category. This curve is not very attractive. 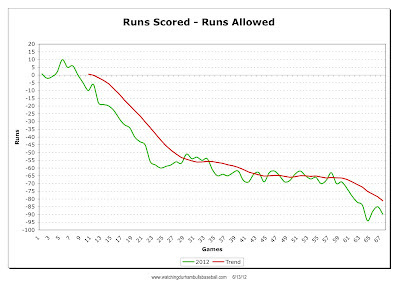 The Bulls have allowed some 90 more runs than they have scored. Moving on to our “Road to .500” chart, things are also not looking good. 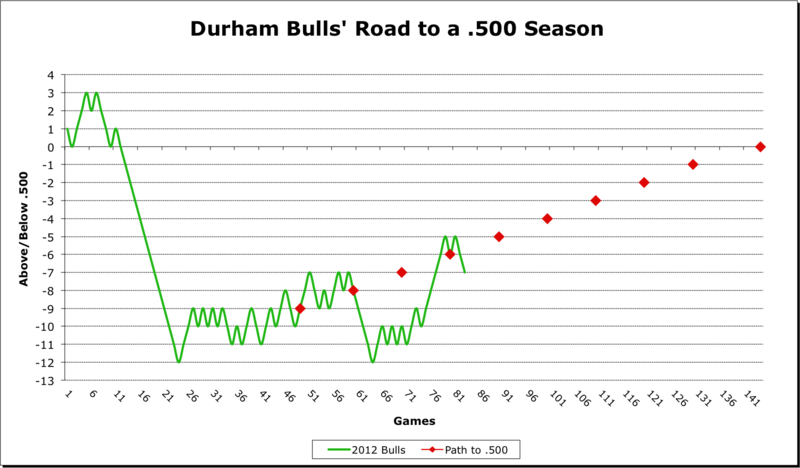 Before the Bulls came home it seemed like they had a good shot at moving right up this path to .500 or maybe even doing better. But now they’ve got to win 44 of the next 77 games to have a 50/50 season. That is, they’ve got to play .570 ball to get to .500 on the season. Tough to do. 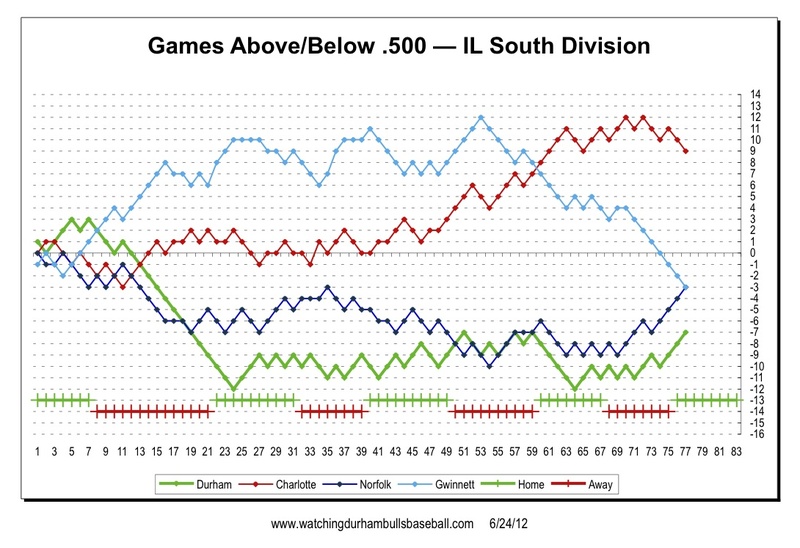 Lastly, a look at the South Division of the International League, as plotted by games above/below .500. The remarkable run of the Charlotte Knights and the striking fall the Gwinnett Braves are the major features of this chart. All in all, a pretty miserable home stand, possibly the worst in recent memory. Two wins against a not very good Toledo is nothing to shout about. In yesterday’s game Jim Paduch had an awful start and was pulled after two outs in the 2nd inning. The one small light in an otherwise gloomy day was Shawn O’Malley’s good time at bat. His double and home run pumped up his OPS to .589. By no means great, but a good bit better than it was. The Bulls have a day off today. Good. Then they head out to Lehigh Valley, Pennsylvania and Rochester, New York to continue this very long stretch of out-of-division games. They will have played Indianapolis, Louisville, Scranton/Wilkes-Barre, Toledo, Lehigh Valley, Rochester, Buffalo, Syracuse, and Buffalo again before a few games with Norfolk, Gwinnett, and Charlotte in July. They will all be different teams by then. Here’s a puzzle for us. At the start of the season the Rays were being praised for the depth of their starting pitching. So much so that there were persistent rumors about a trade involving names like Niemann and Davis. Where did the depth go, or was it an illusion to begin with? Here in Durham we have only Chris Archer showing any promise at all as a starter. With a collective ERA of 4.99, the starting crew is spotting a bunch of runs every game. The relief crew is slightly better with a collective 4.25 ERA, and includes the shining lights of Brandon Gomes and Bryan Augenstein. Overall, the team ERA of 4.65 is the worst in the International League. If the Rays come looking for help in July (as they often do), will there be anyone here? Reid Brignac’s grand slam is the story here. As it should be. It was, reportedly, his first professional slam, so it must have been a huge thrill for him. It sure was for us. By us, I mean anyone who was watching TV or listening to the game. Besides Wool E. Bull, the rain apparently chased all but a few die hard fans away. Congratulations to the fans who stayed and got to watch the hit in person and to Mr. Brignac for the hit. The beginning of the game was all too familiar. After a nearly two-hour rain delay the Mud Hens got two runs in the 1st inning and another in the 2nd. But then Toledo’s Thad Weber gifted the Bulls with two walks and a hit batter (new guy Brandon Allen) to set up Brignac’s heroics. Following the big hit, Shawn O’Malley bunted his way on and then scored all the way from first base on other new guy Rich Thompson’s double. Lance Pendleton worked awfully hard through four innings (93 pitches) and he was pulled before he was eligible for the win, which went to Ryan Reid. Once again the team of Augenstein and Gomes did a masterful job of closing out a game. New guys Brandon Allen and Rich Thompson are likely to be just the beginning of changes to the Bulls’ roster. Rays infielder Longoria and pitcher Farnsworth are getting close to returning; infielder Keppinger is looking to be playing by the end of the month; outfielder Fuld and catcher Chirinos may be getting ready; and Bulls infielder Beckham is nearing the end of his 50-game suspension. In almost every case, if a player gets activated we will see a ripple effect in Durham. Make sure you pick up a program on your way in to the next home game. No telling who will be on the team. After today’s game, the Bulls won’t be back in town until June 22nd. Lunch at the park today sounds good to me ... if the rain holds off. Ever wonder about spitballs? Former Durham Bull pitcher and, briefly, Italian League prospective star Dirk Hayhurst has some comments on his blog. Matt Torra had a fine outing and the Bulls put up 15 hits, 14 of them singles (a Leslie Anderson double was the only extra-base hit). What a change from the last five awful games. When the Mud Hens put up the first run of the game in the 2nd inning, things were looking pretty bleak. But then some nice baserunning by new guy Rich Thompson after he got on as a hit batsman helped out a lot. He made it to third on a Stephen Vogt single and came home on a sac fly by Jesus Feliciano. When Anderson doubled Vogt home the Bulls were ahead for the first time this home stand. The five-run 5th inning was icing on the cake. We’ll have to keep an eye on it, but it may be that the Rays are looking to see if Alex Torres has some possibilities as a lefty specialist. At least that was what the commentary implied last night. He came in for three batters at the top of the 8th (righty, lefty, lefty) and got 2 Ks to go with his usual BB. He was pulled when a righty came to bat. When Matt Torra came off the DL someone had to go. Craig Albernaz has been shipped off to “Hudson Valley”. Some cute photos here from the Bark in the Park event earlier in the week. You may have noticed the signage in the outfield that designates the DBAP as “Goodman Field”. That would be Jim Goodman, the owner of the Bulls and certified medial mogul. Time magazine’s Joe Klein recently interviewed him. The Bulls will be on national TV in tomorrow’s game that closes out the Mud Hens series. It’s been a while since we’ve put up our cumulative ERA chart. 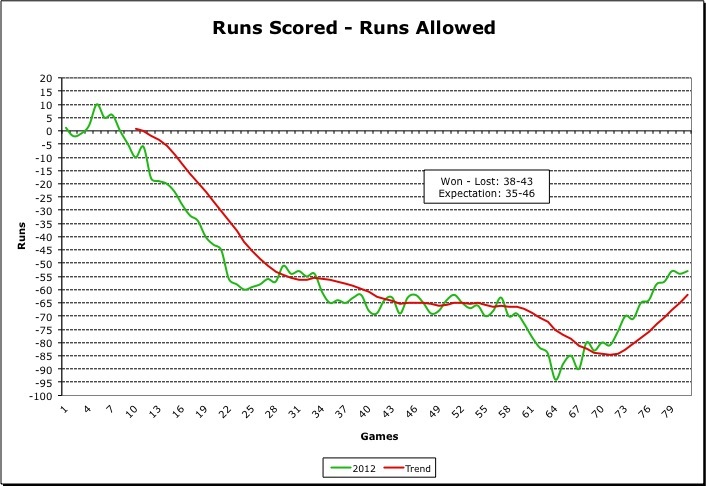 This is the running totals for the last 20 games. Sure looks like the starting pitching (never all that good to begin with) really blew up. Trend line is ever so slightly downward, a good thing. 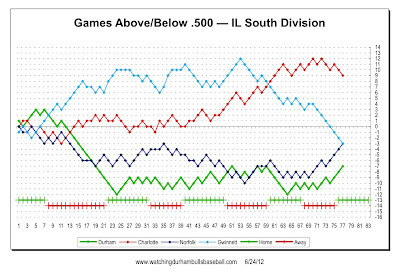 The two most famous teams in minor league baseball usually have a good series, but it’s off to a bad start for the Bulls. Shane Dyer who, if not terrific, looked OK his last start, got blown off the mound early when he gave up six runs. Jhonny Nunez kept things under control, but Josh Lueke gave up four more runs. Who had the best ERA the night's crew coming into the game? 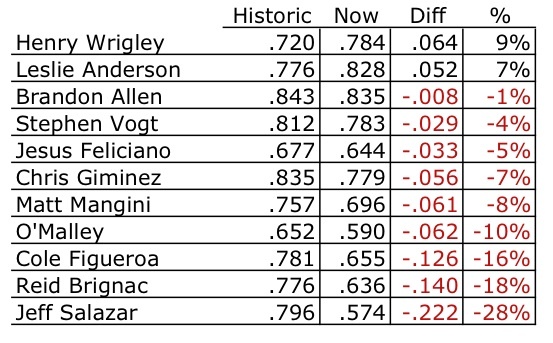 Catcher Craig Albernaz at 0.00. Who had the best ERA leaving the game? Catcher Craig Albernaz, although it had ballooned up to 2.25. I’m watching all the games of this home stand, so far, on television, so I get to see Albernaz up close. He’s taking this job pretty seriously. Mostly, the idea of a catcher coming out in relief is essentially a stunt to save the bullpen for another day. Certainly that was the case last night when the score was already 10-1. But he’s been up 4 times already this year (twice this week). That is very disturbing. Don’t take this wrong Mr. Albernaz, but I really don’t want to see you on the mound again. Juan Miranda was released to make room for Brandon Allen. I didn’t really expect that to happen, because I am notoriously poor at guessing roster moves, but he was the obvious choice. Allen is supposed to be in Durham today. OPS, on base percentage plus slugging, is a pretty good stat, although the sabermetrics guys like wOBA better. Here’s the current Bulls roster. 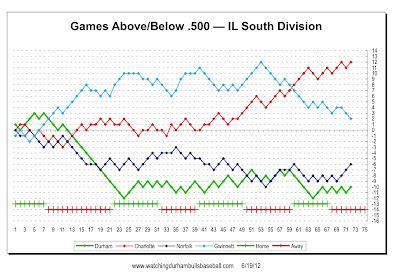 Only three Bulls hitters are above the “average” cut line of .700 and four are below the “poor” cutline of .600. Most are in the "poor" range of 600-700. To be fair, Rich Thompson hasn’t had much of a chance yet. That’s what is known as a blinding glimpse of the obvious. Clearly Mr. Archer has some talent, but if he spent less time trying to master the slightly disheveled look that seems to be so important to him and get focused on the game, then his won-loss record (3-8) might be more in line with his fairly decent overall stats. In the meantime, watching this one on TV I got some closeups of two guys who are really helping the Bulls (instead of digging holes they can't get out of), Bryan Augenstein and Brandon Gomes. Augenstein, signed out of the Cardinals system, pitched one game as a starter back on April 7th, but then went on the disabled list. He came back in a relief role and made his first appearance on May 22. Since then he has put in 11 innings in relief and has not allowed a single run (he only allowed 1 run in that start back in April). His ERA is slightly behind Brandon Gomes (0.53 to 0.43), but he leads the team in all other categories. I mentioned Brandon Gomes a couple of days ago. Gomes appeared in 5 games back in April, went up to Tampa Bay for a while, then came back the second week of May. He was doing fine before he went to the Rays. He’s been spectacular since his return. In 11 appearances he’s pitched 15 innings for four saves and three wins. Overall, his won-loss record (4-0) is the best of any Bulls pitcher. (As a closer! How sad is that?). Lest we get our hopes up, note that the one run the Bulls got last night was on a bases-loaded balk by a Yankees reliever. Brandon Allen is coming to Bulls. Any guesses on who’s going to be leaving? 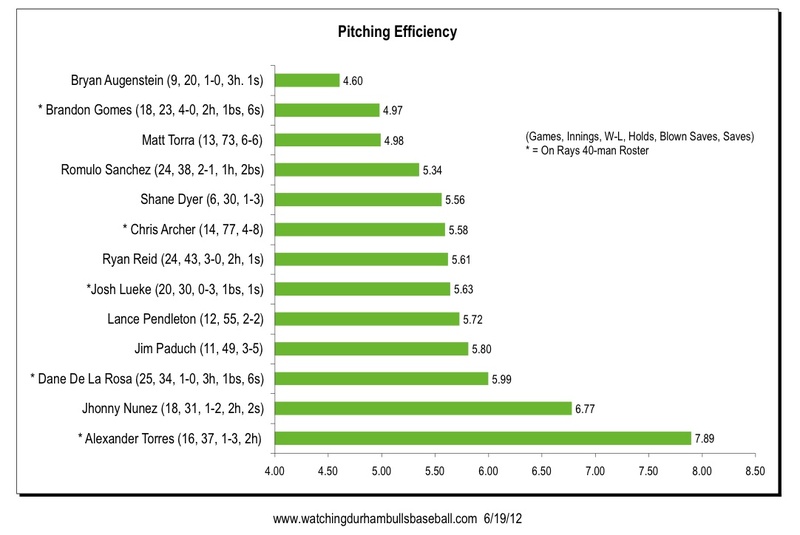 Fielding Independent Pitching is one of these relatively new bits of sabermetric thinking. I don’t like the idea of a constant creeping into any stat, but it purports to be relatively independent of the skill of the defense. With any minor league stats, and at this time of the season, sample size is important and for some of these guys the sample is pretty small. Bases on balls and home runs will kill your FIP stat (as they should, but as with early in the season runs and ERA, early season homers skew the stat). Independent Weekly writer Sam Stephenson was driven to quote a friend who said the food at the DBAP was just right for pregnant folks. Can’t blame him for using the quote. Who would want to write about the baseball in the last three games? So how about a modest rant about one of the players who really isn’t helping the Bulls, Juan Miranda? The last time he got on base was back on Tuesday when he got hit by a pitch. I don’t have the stats at hand, but it sure seems like someone’s usually on base when he comes to bat, but he’s only managed to knock 8 of them home this year. For a guy who was hired for his power, his OPS of .580 is just pitiful. Two years ago when he was playing for these very same Scranton/Wilkes-Barre Yankees his OPS was .866 over 80 games. Broadcaster Kinas keeps saying nice things about him and his performance in batting practice. Wonder why his game is being left in the batting cage? New guy Rich Thompson played center field last night. Looked uncomfortable on the TV. Not his first time at the DBAP, though. A couple of hits and a stolen base. So, welcome to Durham, Rich! Happy to have someone with speed out there. In fact, with Feliciano, Salazar and Thompson, the Bulls have a pretty speedy bunch. Update: Brandon Allen has reportedly been outrighted to the Bulls. We first took a look at this situation as the Bulls were heading out on the road trip. Our reasoning behind picking .500 as a reasonable goal for the 2012 Bulls is here. For the Bulls to hit .500 by the end of the season they have to win 46 of their remaining 85 games. Said another way, they have to play .540 ball to get to .500 by September. That’s an improvement over the situation 10 days ago, and they’ve been on the road all that time. Here’s an update of my chart from that same post. 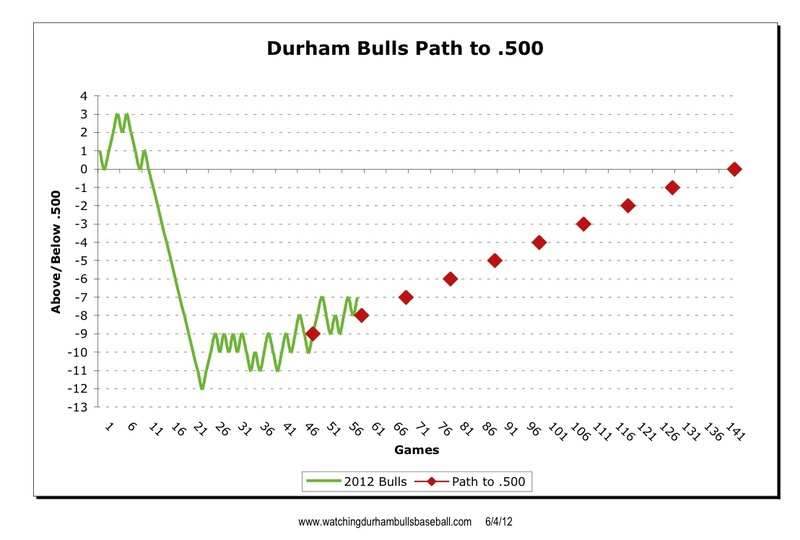 As of now, the Bulls are on track to reach the .500 goal. Not much to say about Sunday’s game. The Bulls were shut out by the Bats’ Jeff Francis and Chris Archer got his third straight loss. As meaningless as wins and losses are supposed to be, Mr. Archer really isn’t having a very good year. Should we start worrying? Meanwhile Mr. Francis and the Reds decided to part ways sometime after Sunday’s complete game shutout. I’ll probably do my annual rant about opt-out contracts someday soon, but not now. Let’s wait until they start having an effect on the Bulls. Francis (and his agent, most likely) must have decided that it was time to pull the plug. Who knows? Maybe, as commenter Doug Milhoan said, he could end up in a Rays/Bulls uniform in a few days. Tonight’s game was a certainly nice win. Young Shane Dyer got his first AAA win. Stephen Vogt got his third home run (his OPS has snuck up to .692; is he getting his 2011 eye back?). Desmond Jennings got his second hit (2-12) in his rehab assignment and is reportedly heading back to the Rays. Bye. Brandon Gomes is never going to be the equal of either WDBB favorites Winston Abreu or Joe Bateman for sheer on-the-mound presence and outright thrills. But he sure can pitch! He got his fourth save since his return from Tampa Bay on May 11th, and he’s picked up three wins during that same period (he’s 4-0 on the year). An ERA of 0.45 (he’s only given up one earned run this year! ), a FIP of 1.35, a WHIP of 0.85. So I guess we can do without the twitches of Abreu or the thrill of Joe Bateman walking two or three batters before striking out the side. We’ll just settle for Mr. Gomes, and be thankful for his presence in a Bulls uniform. Cannot complain about a 6-4 road trip. Congrats to the Bulls! Matt Torra has been put on the disabled list and Jhonny Nunez is to start Tuesday night. Did anyone hear why? I was only been able to listen to bits and pieces of the game. Personal note: For those of you who have noticed that that there’s been an empty seat beside me most of this year, Fran's back has been giving her fits. She went in for surgery today and is doing quite well. Probably a long rehab, but should be back in her seat before the end of the season. My posting/game attendance is likely to be a bit erratic over the next couple of weeks as well, but I will be there some of the time. And eventually both of us will be there cheering on the Bulls as usual. And don't forget to raise a glass and/or just simply sing along in remembrance of Doc Watson during Tuesday night's 7th Inning Stretch! The 6-run 5th inning was really nice. I’m not sure, but I don’t think the Bulls have had an inning like that all year: ten players came to bat, six hits (3 doubles), two BBs. And before the 5th inning, Stephen Vogt and Leslie Anderson hit solo home runs in the 1st and 3rd. Jim Paduch and a host of relievers got stretched out; however, except for a couple of errors by infielders Reid Brignac and Cole Figueroa, a very nice game. This is a lineup (with Chris Gimenez and Shawn O’Malley) that we hope to see a lot of for the next month or so. If I weren’t suspicious of the weakness of Louisville pitching, I’d say this looks very promising. I saw the name in the lineup in the first game, but for some reason it didn’t sink in. Then I wasn’t able to listen to either of the last two games except intermittently, so I probably missed Patrick Kinas reporting on the situation. But for old-time Bulls fans one of our favorite players of all time was on the field for the Louisville Bats — Joey Gathright. Joey Gathright ruled the base paths at the DBAP from 2004-2005, stealing 64 bases in those years. He has since been all over, including a few visits back to the DBAP in, as I recall, a Norfolk Tides uniform. The last three years saw him in Indie ball, then with the Tides, back to Indie ball and then with the Pawtucket Red Sox. He was just signed out of Indie ball by the Cincinnati Red and sent to Louisville. In every case, I’d bet, the major league club is looking for speed on the bases and the outfield, and a backup professional within easy reach. Since the Bats have already played in Durham this year we aren’t going to be able to see him play. Too bad. Even at 31 I’d guess he’s still a formidable ballplayer. For some good stories, do a search on "Gathright" in the search box at the top left. Elsewhere it was recently noticed that the Rays aren’t doing a very good job developing hitters. No kidding. We haven’t written much about that issue, but Rays Prospects has. And the few hitters that have done well as Bulls haven’t done well, or been treated well, by the Rays: Chris Richard, Justin Ruggiano, Dan Johnson, Russ Canzler to name a few. And none of those came up through the Rays system. Can anyone out there think of a proficient batter developed through the Rays system (other than Longoria, that is)? First let’s explain why the Bulls were playing baseball at midnight on Thursday night. Outside their divisions, the teams in the International League play four games at home and four away. If weather rolls in for the last game of the last series, then the teams will have no opportunity for a makeup. That happened to the Bulls last year and they only (only!) played 142 games instead of 144. The teams and the umps will go to great lengths to not let that happen. Hence on Thursday night the teams sat around the park for over two hours hoping to get a game in. That also explains why I was able to (barely) hear the game as I was driving through a storm on the Raleigh beltline at 11:30. But have to say that I didn’t find the game all that interesting. The Indianapolis Indians have figured out how to beat the Bulls this year and the best news about the trip is that the Bulls don’t play them again. Just down the road in Louisville, however, we find the one team that the Bulls have been able to defeat this year. 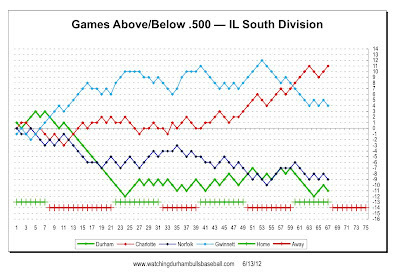 Not that the Bulls are alone, the Bats have the worst record in the IL. Too bad, because over the years the contests between the Bulls and the Bats have usually been just terrific to watch and the two teams were routinely among the best in the league. The Bulls lineup was fleshed out with rehabbing Ray and former Bull Desmond Jennings. He played a few innings in left field and went 1 for 4. Along with Jennings recent returnees Stephen Vogt (RF, 2 for 4) and Chris Gimenez (C, 1 for 4) were also in the lineup and did a good job of supporting Lance Pendleton. 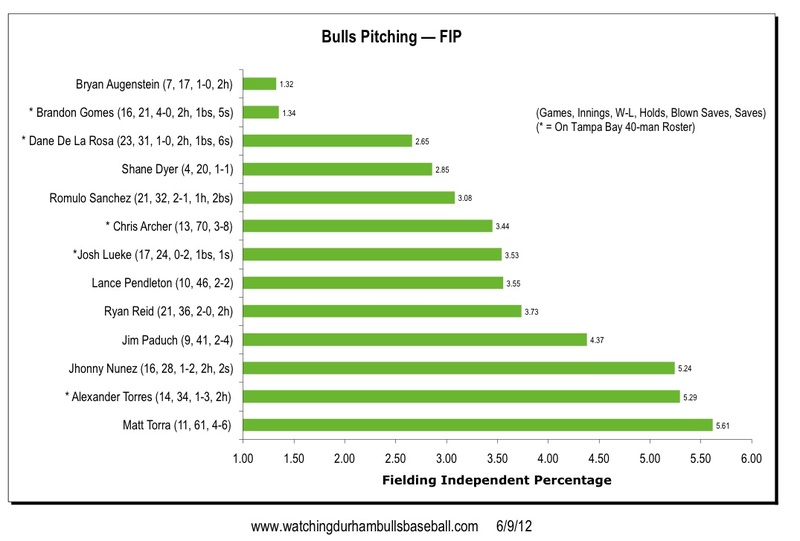 Pendleton has become the Bulls best starting pitcher, by a bunch. In his last three starts, for example, he has gone more than 6 innings each and allowed only one run in each game. 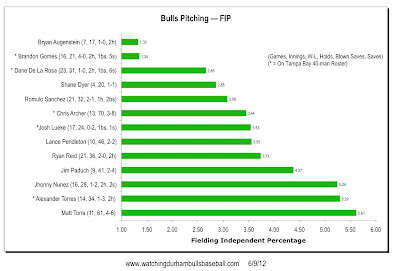 His ERA at 2.93 is the best of the Bulls starting pitchers. In his seven starts, the Bulls have gone on to win the game six times. All this from a guy who wasn’t even in the Rays system at the start of the season - - Pendleton came to the Bulls by way of the Sugarland Skeeters just after Bryan Augenstein went on the DL back in early April. Hideki Matsui hit another home run last night (sigh). Craig Albernaz gets a chance to chat about his pitching prowess. Interesting piece on the Rays locker room feeling. 22 days, 5 hours, 3 minutes. That’s how long it took Diane Van Deren to run from Clingman’s Dome to Nag’s head. That was two days faster than the previous record. Blog entries are interesting, particularly the ones from her run through Tropical Storm Beryl.